Revamped Start Centre: TuneUp Utilities Start Centre has been completely revamped. The new start centre gives you a quick idea about the current condition of your computer and provides quick access to all the utilities. Undoubtedly, the new interface is a big improvement over the previous tabbed UI. 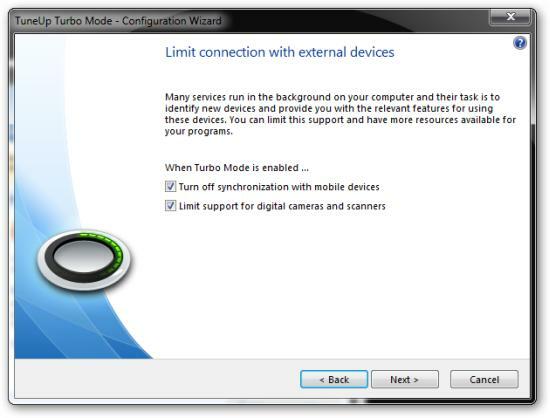 TuneUp Turbo Mode: Turbo Mode gives you an immediate performance boost by disabling unnecessary services and processes. It is functionally somewhat similar to GameBooster. TuneUp Utilities Gadget: This is possibly the most useless component of TuneUp Utilities 2010. TuneUp installs a sidebar gadget for Windows Vista and 7, which displays your computer’s current status. It is possibly the most useless component of TuneUp Utilities 2010. 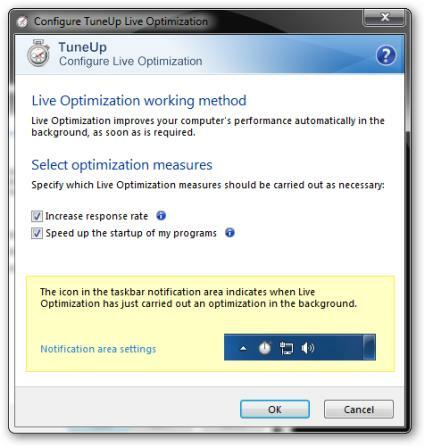 TuneUp Live Optimization: TuneUp 2010 keeps working in the background and intervenes whenever necessary to prevent sudden performance drops. Live Optimisation intelligently prioritises processes. It increases the priority of processes that may require more resources. At the same time, it decreases the priority of processes which are consuming extravagant amount of system resources. This can avoid system lockups or crashes. Live Optimization is potentially a great feature and is in fact similar to Process Lasso which I had reviewed earlier. However, I couldn’t find any way to turn this off. I definitely don’t appreciate the fact that TuneUp 2010 adds additional background processes, without providing the option to turn them off. Optimisation Report: This new addition displays a simple summary of maintenance and optimisation tasks performed by TuneUp. Improved Registry Defrag: Registry defragmentation has been improved. It is no longer necessary to reboot your system immediately after performing registry optimisation. TuneUp has also added a pre-boot module which optimises your registry before Windows is loaded. Improved Drive Defrag: TuneUp defragmentation tool now offers two modes – i) Fast and ii) Thorough. 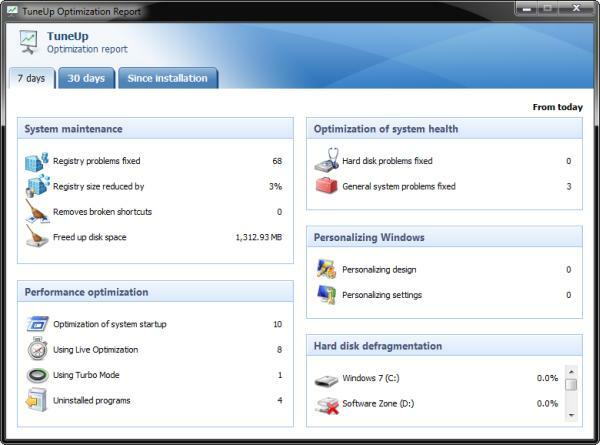 Support for Windows 7: TuneUp Utilities 2010 supports both 32bit and 64 bit editions of Windows 7. One point worth nothing here is that TuneUp no longer allows installation of Visual Styles (Themes) – at least not in Windows 7. Others Improvements: Various other utilities including 1-Click Maintainence, Automatic Maintaince, and Disk Cleaner have been improved. The full version of TuneUp Utilities costs $49.95 while the upgrade license costs $29.95. TuneUp Utilities is the best in its category. It offers everything you will need to optimise, customise and maintain your system. 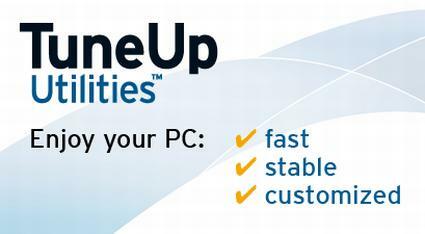 If you haven’t purchased TuneUp before and are looking for a system utility then go for TuneUp 2010. However, the decision is a lot more complex for owners of TuneUp Utilities 2009. 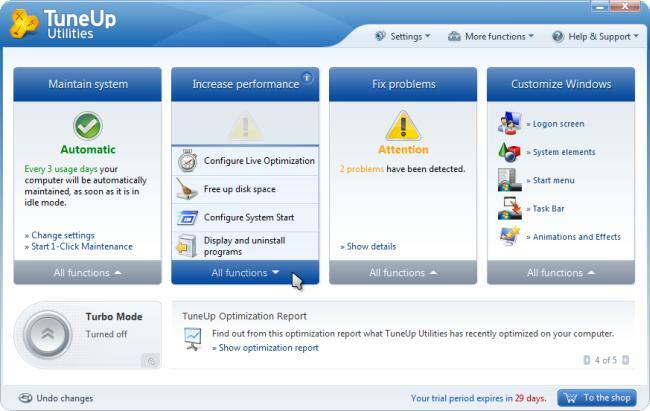 The major additions to TuneUp Utilities 2010 are Turbo mode and Live Optimisation. Not everyone will need them. And even if you do need them you can simply use GameBooster and ProcessLasso. TuneUp 2010 doesn’t offer enough additional benefits to merit a $29.95 upgrade license. Heck, at that price you can get Apple’s Snow Leopard upgrade! The real deciding factor here is Windows 7. TuneUp 2009 doesn’t officially support Windows 7. The newer builds of TuneUp 2009 obstinately refuse to even run on Windows 7. The older builds do run on Windows 7 and all the major components (Registry Cleaner, Drive Defrag, Registry Defrag etc) seem to work properly. However, there are a few glitches here and there. More importantly, TuneUp 2009 doesn’t contain any Windows 7 specific optimisation and there is always the possibility that things may go wrong. Hence, if are using Windows 7 (or plan to migrate to Windows 7) you may not have a real choice. I do most of my optimization manually, but this is good news for those who use TuneUp. .-= ShaunakÂ´s last blog ..Modernized Halloween Costumes =-.